At the end of February, IDC members and partners in Malaysia came together for a two-day national workshop aiming to develop a collective theory of change. Various groups have been advocating for alternatives to immigration detention for children in Malaysia since 2012. However, advocacy initiatives have tended to focus on relatively short-term goals and emerging opportunities. The workshop provided a space for discussion about longer-term goals and strategies, as well as ways in which to respond to challenges, gaps and risks related to advocacy for, and implementation of alternatives. 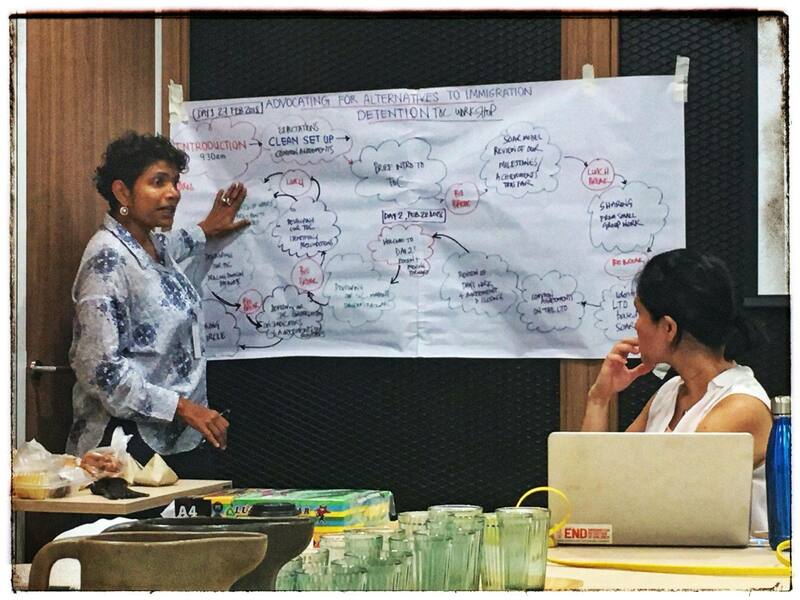 The IDC brought together members and partners from civil society, the national human rights commission, and UN agencies to begin the process of building a theory of change on how to end the immigration detention of children and their families in Malaysia. Through this process, participants were able to build a common understanding on some of the interventions required to strengthen advocacy initiatives in Malaysia. The next step will be to further flesh out and examine ways of implementing these interventions, as well as refining other aspects of the theory of change. Similar workshops are planned in Thailand and Indonesia in early 2018.